The verse truly is fascinating, providing the very first biblical glimpse of God’s plan of redemption, focusing ultimately upon the final thrusting of Satan into the eternal hell of fire (Rev. 20:10). That this “serpent” was a vehicle of Satan is beyond dispute. Paul says that the “serpent beguiled Eve,” and, in the same context, he argues that “Satan fashions himself into a messenger of light” (2 Cor. 11:3, 14). Moreover, John’s references to Satan as “the old serpent” (Rev. 12:9; 20:2) are obvious allusions to the Genesis record. Moses designates the speaker as “Jehovah [LORD—KJV] God” (v. 14). The Hebrew term in the first instance is Yahweh — a designation of the self-existing Creator (cf. Ex. 3:14), who will form a special redemptive, covenant relationship with the nation of Israel. The second title is “God” — Elohim. Though the etymology of the term is obscure, it likely derives from a root form meaning “strong.” The name appears to be used mainly of God’s right to govern his world and mankind (Clark, 239). The combined use of these names lends great force to the utterance that follows. Let’s briefly consider the various participants and components of this intriguing text. Jehovah’s remarks in Genesis 3:15 are addressed to the serpent immediately, though to Satan ultimately (cf. Rom. 16:20). Modernists dismiss the clear import of the biblical record. They allege that Satan is but a “personification of the self-accusing conscience of Israel” (Gray, IV.4298). However, both Testaments of the sacred volume treat him as the personal, arch-enemy of Almighty God. He is the murderer of fallen humanity (Jn. 8:44; Rom. 5:12). Following his malicious deed, this curse from Jehovah God previews the devil’s horrible destiny. The woman of the context is Eve. But the main focus is not upon her; rather it is upon her seed (see below). On the other hand, while there is mention of the serpent’s seed, the primary thrust is toward the destruction of the malignant force working through the serpent (i.e. Satan), rather than upon this enemy’s seed — though certainly they will share his fate (Mt. 25:41). The term “enmity” denotes a disposition of hostility, whether between individuals (Num. 35:21-22), or between bodies of people (Ezek. 25:15; 35:5). Between what parties is there enmity, as suggested in this text? While some see it as an abiding antipathy between humans and snakes (Owen, 13), clearly the scope moves far beyond such a trite explanation. The language denotes the initial spirit of antagonism between Eve and her adversary (her destroyer), together with the suggestion that there would be a spiritual hostility developing between the woman’s seed, Christ (along with his people), and Satan and his followers. This theme is well illustrated in the parable of the tares (see Mt. 13:24-30; 36-43; cf. 1 Jn. 3:10). The text represents Jehovah as saying, “I will put enmity ....” How is the origin of this hostility to be attributed to God, who is an absolutely holy Being (Isa. 6:3; Rev. 4:8)? There are two components. First, there is a standard of truth and righteousness which proceeds from the very nature of deity. Second, rational individuals are creatures of moral responsibility. When men (or spirit beings, e.g., angels) exercise their volition, and rebel against the Creator, enmity is bound to result. God, then, is the author of the enmity only in the sense that he makes demands upon responsible beings — which frequently they choose to ignore (cf. Ex. 7:3ff). Who is the woman’s seed? Simply her descendants? Or is Christ involved? An affirmative answer to the first question is not plausible. Clearly, the seed promise of this entire book (Gen. 22:18; cf. Gal. 3:8, 16) finds its complete fulfillment in the Savior who, in the fullness of time, was “born of woman” (Gal. 4:4). Sometimes the claim is made that Genesis 3:15 is a precise prophecy of the “virgin birth” of Jesus, since the phrase “seed of woman” appears to be unique. In the normal conception process, it is alleged, the male provides the “seed.” Will this argument stand the test of candid investigation? Frankly, it will not. The “seed” of Hagar is mentioned later in the book (16:10), as is also the “seed” of Rebekah (24:60), and yet no virgin births were involved in those cases. The expression does not “exclude a virgin birth,” but the grammar alone does not establish it (Lewis, 11). “It is not right to infer the virgin birth from the Protevangelion, but it is certainly quite legitimate to look back from the point of view of the virgin birth and see how marvelously close were the words of promise to the mode of the performance” (80). H. L. Ellison goes so far as to say that: “Not until the Virgin Birth could the full implication of the promise be understood (cf. Isa. 7:14)” (138). In the common versions, the term “bruise” is twice found. Satan bruises the Seed’s heel; the woman’s Seed bruises the serpent’s head. Some translators prefer to render the first instance as “bruise” or “strike at” (NIV), while rendering the latter term by “crush” (Beck; Stigers, 78). Some contend that the Hebrew verb swp (“bruise”) occurs twice in this verse, but that contextual considerations suggest a varied rendering. A man can “crush” a snake’s head, while the snake can only “bruise,” or wound, the man’s heel, without the action necessarily being permanent. The translation should conform, they suggest, to the nature of the circumstances. Others allege that the text actually contains similar, though different, words. Stigers argues that “crush” and “bruise” represent "a play on two Hebrew words that look alike, as though from the same root. But bruise is from suph, whereas crush is from saaph, an allied root (Stigers, 79; see also Harris, et al., 912; VanGemeren, 67). “Whatever the exact meaning of the verb, the picture seems to be clear. To bruise the head is a picture of fatal and final destruction. To bruise the heel is a picture of damage, which is neither fatal nor final” (51). In the final analysis, we must say that the complete biblical picture does reveal a difference in the significance of the terms. Christ’s death for human sin was, in effect, a wound rendered by Satan. But the Lord’s resurrection, exaltation, and final victory will destroy the devil’s revolting efforts (Rom. 8:20-21; 1 Cor. 15:26; Col. 2:15; Heb. 2:14; 1 Jn. 3:8; Rev. 20:10). There are a number of important points that we would make in concluding this discussion. These are practical points from which we may learn and enhance our own spiritual lives. Consider the following. There is the fact that Satan is a real enemy, and a formidable opponent. He lied to Eve, and he murdered the human family (Jn. 8:44). He is the ever-tempting one (Mt. 4:3 — a present tense participle) who, as our adversary, continuously is on the prowl for those whom he may devour (1 Pet. 5:8). Nothing could please him more than for liberal theologians to dismiss him as a mythological metaphor. Elsewhere we have discussed the history and mission of Satan in greater detail (Jackson, 103-111). Allegations that the “serpent story” is a mere legend, are based upon anti-supernatural presuppositions. The God who fashioned all creatures certainly could, for a special occasion, empower a serpent to speak, just as in the case of Balaam’s donkey (Num. 22:28). The inspired Paul viewed the episode as strictly historical (2 Cor. 11:3). There also is archaeological evidence that connects the serpent image with man’s original fall. A seal was discovered at ancient Nineveh depicting a man and woman on either side of a fruit tree. To the left of the woman stands a serpent. Dr. Ira Price of the University of Chicago suggested that it likely portrayed an early tradition of the fall of man (89). Serpents have been associated with the destruction of human immortality in several ancient cultures (Handy, 1114). Such traditions, though distorted, may be traced ultimately to the historical events of Eden. Genesis 3:15 is a preview of the incarnate Christ. The expression “seed of woman” implies humanity. The virgin would conceive and bear a son (Isa. 7:14). [Note: The reference is not to Isaiah’s son, as some erroneously allege (Owen, 13).] Indeed, a child would be born, a son given (Isa. 9:6). The apostle John, of course, notes that the eternal Word “became flesh” and dwelt among the human family (Jn. 1:14). There are tremendous reasons for the necessity of the Redeemer being human, not the least of which is the fact that a spirit-being cannot die a physical death (cf. 1 Tim. 6:16). But Jesus partook of the nature of humanity that “through death he might bring to naught him that had the power of death, that is, the devil” (Heb. 2:14). The allusion to the woman’s seed being bruised unquestionably looks to the suffering of Christ on behalf of the sins of humanity. In Isaiah 53, there is a vivid portrait of Jehovah’s abused servant, the Christ (cf. Lk. 22:37; Acts 8:32-35). Twice the prophet speaks of the promised Messiah being “bruised” (daka) and wounded as an offering for sin (53:5, 10). Incidentally, this symbolic prophecy of the death of Christ is in conflict with certain dispensational allegations, namely, that the Lord’s death was not a part of Heaven’s original plan. S. D. Gordon, in his book Quiet Talks about Jesus, wrote: “It can be said at once that His dying was not God’s own plan. It was conceived somewhere else and yielded to by God” (85). The fact that only Christ’s “heel” (in contrast to the serpent’s “head”) was to be injured, obviously alludes to the Lord’s resurrection from the dead. Jesus’ death would not terminate the divine mission. 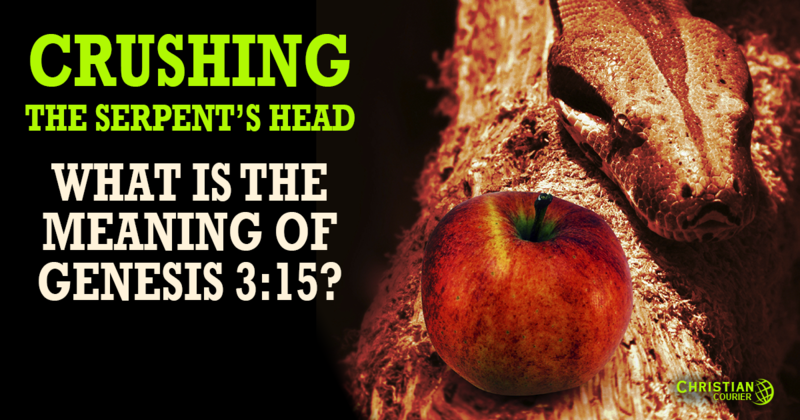 The allusion to the serpent’s seed ominously predicts that many of the human family would choose to be aligned with Satan, rather than with the Son of God. This stands in bold relief to the modern notion that all men basically are good, and are, therefore, perfectly at liberty to pursue the course of their own interests in life with Heaven’s approval. Genesis 3:15 contradicts universalism. The prophecy reveals that the glorious cause of the woman’s Seed would prevail ultimately. Satan and his forces will be crushed. “And the God of peace shall bruise Satan under your feet shortly” (Rom. 16:20). Observe the expression, “your feet.” The redeemed will partake of Christ’s triumph! (cf. Rev. 19:14). Though Paul’s prophecy may refer to a situation more immediate than remote, the term “shortly” does not necessarily demand chronological proximity. Rather, “the phrase means ‘swiftly.’ As with a swift stamping of the feet one crushes a snake’s head...” (Lenski, 922). As noted earlier, Satan’s dreaded destiny is graphically set forth in the concluding book of the Bible (Rev. 20:10; cf. Mt. 25:41). And so, Genesis 3:15 is a grand depository of rich, prophetic information. In capsulated format, it highlights the origin of human rebellion. But it does not leave the drama hanging; rather, the glorious triumph of the woman’s seed is previewed. The “rest of the story” is depicted in the book of Revelation! This Old Testament text certainly is worthy of the designation “first gospel.” It is the gospel, sketched in an abbreviated form, which concept, in fact, has the endorsement of Scripture itself (cf. Gal. 3:8). Did Balaam Prophesy Concerning the Messiah? Who Is the Mysterious Shiloh? Did the Ancient Gentiles Have the Hope of Salvation? Atkinson, Basil F. C. 1957. The Book of Genesis. Chicago: Moody. Beck, W. E. 1976. An American Translation. New Haven, MO: Leader Publishing Co.
Clark, Gordon. 1999. “God” Wycliffe Dictionary of Theology. Eds., E. Harrison, G. Bromiley. C. Henry. Peabody, MA. Gordon, S.D. 2003. Quiet Talks about Jesus. Shippensburg, PA.
Ellison, H.L. ; Howley, G.E.D. ; Bruce, F.F. eds. 1979. “Genesis I-II.” The New Layman’s Bible Commentary. Grand Rapids: Zondervan. Gray, G. B. 1899. “Satan,” Encyclopedia Biblica. Cheyne & Black, eds. London: A. & E. Black. Handy, L.K. 1992. “Serpent (Religious Symbol).” The Anchor Bible Dictionary. David Freedman, Ed. New York: Doubleday. Vol. 5. Harris, Laird. ; Archer, Gleason; Waltke, Bruce, eds. Theological Wordbook of the Old Testament. Chicago: Moody, Vol. II. Jackson, Wayne.1983. The Book of Job. Abilene, TX: Quality. Kevan, E.F. 1954. “Genesis.” The New Bible Commentary. E. Davidson, ed. Grand Rapids: Eerdmans. Lenski, R.C.H. 1961. The Interpretation of Romans. Minneapolis: Augsburg. Lewis, Jack P. 1988. Exegesis of Difficult Passages. Searcy, AR: Resource Publications. Murray, George. 1948. Millennial Studies. Grand Rapids: Baker. Owen, Dan. “The Gift of God’s Son” Gospel Advocate. December 2013. Price, Ira M. 1907. Monuments and the Old Testament. Philadelphia: American Baptist Society. Stigers, Harold. 1976. Commentary on Genesis. Grand Rapids: Zondervan. VanGemeren, W.A. 1997. Dictionary of Old Testament Theology & Exegesis. Grand Rapids: Zondervan. Vol. 4.